A little background would help, let’s start with Hey GUYS whats a NFC tag? An NFC “tag” is simply a device that actively or passively sends information to another NFC device. Exactly like the little things that people tap onto door locks to enter office buildings, etc. “Active” means the tag is powered independently whereas “Passive” refers to a tag that requires power from the device it comes into contact with. A passive tag is therefore smaller than an active one – which is consumed spatially by a battery. It’s what everyone is now calling RFID. You probably know what that is. That’s an interesting way to go about it and somewhat elegant the more you think about it. Cool. Hey. OP here. NFC is just a smart new name for the old Venerable MIFARE 13.56 MHz RFID tags. The NFC standard is an extra subset of functions, making it possible for NFC enabled devices to exchange data etc. Future Credit card terminals will use NFC, where you can pay with your NFC-enabled Cellphone. Future? I’ve been doing it for a year now at McDonalds and using my Google Nexus HSPA+ I have seen these future credit card readers for well over 2 years now. Even home depot and Taco Bell has them. In my opinion it is more “overkill” to source a special part than to just buy a SMT 4066 for a few cents. I had some issues to put a comment to the author’s page. So here is my comment that should have gone there. Hopefully he sees it. This is a very interesting approach. I wonder if this would have been possible without opening the tag at all. Right now I am researching Antennas for my DCF77 project http://blog.blinkenlight.net/2012/12/01/dcf77-project/ . Due to this research I think it should be possible to achieve a similar effect without opening the tag at all. 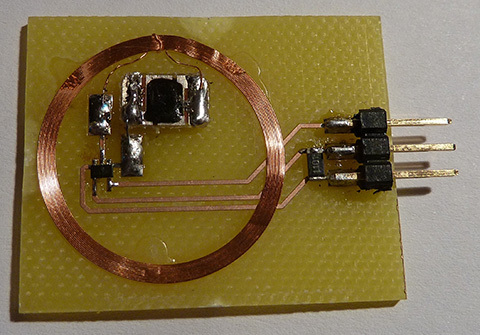 The first idea would be to place a single loop between the tag and the NFC transceiver. Ideally the loop should be centered around the tag and parallel the tag’s antenna. Alternatively it could surround the transceiver in the same manner instead. I’ve seen your comment, and it’s approved now. You had it posted 3 times. My theme fucks op completely, so i’ve resorted to another one now. Comments work correctly now! But you would have to plug it in every time and it would look ugly/out of place or something maybe? “What is it with people doing things the hard way?” Because it’s more fun this way, that’s one of the points of hackaday, it is not? The easy way would have been to pause/unpause by touching the tablet’s TOUCHscreen instead of touching the NFC pushbutton, but where would be the fun in that? It would be great to use the NFC tag as a bridge between the car’s “CPU”, and the tablet. For example, if you have a steering wheel with buttons, that these buttons sends over the NFC a command to android… or if you have a little screen in the cockpit (like my car) you could use NFC to send data from tablet to the cockpit. Its only need some microcontroller and a CAN transceiver. But the problem with that is, how you send the audio from tablet to the car’s stereo? bluetooth? I think the S3’s have inductive charging capabilities built in. I’d have done it via bluetooth. You can send commands like play/pause, next, and back via AVRCP, and Android supports it very well.